ROCHESTER, NY, USA - Gleason Corporation today announced the successful installation of a P 8000/10000 Gear Hobber at Changzhou Tianshan Heavy Industry Machinery Co. Ltd., in Changzhou, China. The machine has the capacity to produce spur and helical gears up to 10 meters in outside diameter, and has been fully demonstrated to consistently produce large gears at DIN 7 quality or better, reducing cutting times from as much as a week on older machines to as little as 10 hours. Founded in 2002, Changzhou Tianshan is a producer of approximately 35,000 gears per year ranging in size from 100mm to 10,000mm in diameter. Through investment in the most advanced gear production machines, Changzhou Tianshan has expanded rapidly and is today a factory of nearly 87,000 sqm, with 300 employees. 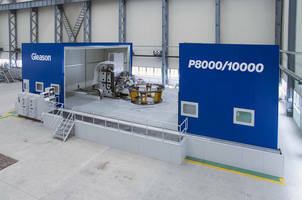 The acquisition of the Gleason-Pfauter P 8000/10000 hobber has opened the doors for new projects in mining equipment, port mechanical equipment and large industrial applications, as well as with several of the world’s leading wind turbine manufacturers, producing planetary gears, sun gears and eccentric gears for wind turbine gearboxes. When asked "Why Gleason", Mr. Jiang Wenge, Chairman of Changzou Tianshan said, "The efficiency and accuracy of similar equipment on the market is low, but customer expectations are increasingly high, and the trend is to higher and higher accuracies and reduced lead times. Gleason-Pfauter has the experience in gear technology, service and support, so a high-quality production machine is assured. Among the manufacturers of high-accuracy large gear equipment, Gleason-Pfauter is the industry leader. There really is no competitor." Gleason Corporation's mission is to be The Total Gear Solutions Provider™ to its global customer base. Gleason is a world leader in the development, manufacture and sale of gear production machinery and related equipment. The Company's products are used by customers in automotive, truck, aircraft, agriculture, mining, energy, construction, power tool and marine industries and by a diverse set of customers serving various industrial equipment markets. Gleason has manufacturing operations in Rochester, New York; Rockford, Illinois; Dayton, Ohio; Munich and Ludwigsburg, Germany; Studen, Switzerland; Bangalore; India, and Suzhou, China and has sales and service offices throughout North and South America, Europe and in the Asia-Pacific region. Gear Shaper eliminates mechanical changeovers.